When a gas explosion that happened in the basement destroyed her shop, many couldn’t believe that one of their favorite chocolate shops in Paris was gone, including Denise Acabo herself. I visited her shortly afterward and she was in shock, missing her store – but most of all, missing meeting all the locals and out-of-towners that came in to visit. I posted an update a few months later from her apartment, where she was keeping busy dealing with the aftermath of the explosion, writing notes, seeing visitors, and dealing with the wreckage. She told me that she wanted to reopen the shop, which she’s had for nearly forty years. But seeing the collapsed floors, shattered glass windows, and caved-in walls, I didn’t think she would have the courage to have the place rebuilt. 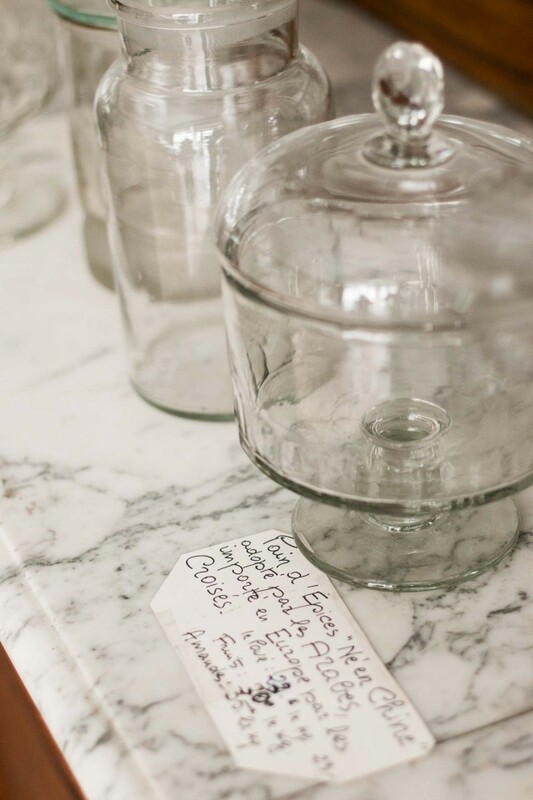 The beautiful wood cabinets that were once filled with jars of French candy, the weathered glass shop window filled with vintage curiosities, and the intricately tiled floor seemed irreplaceable. How could it come back? Well, it’s back. 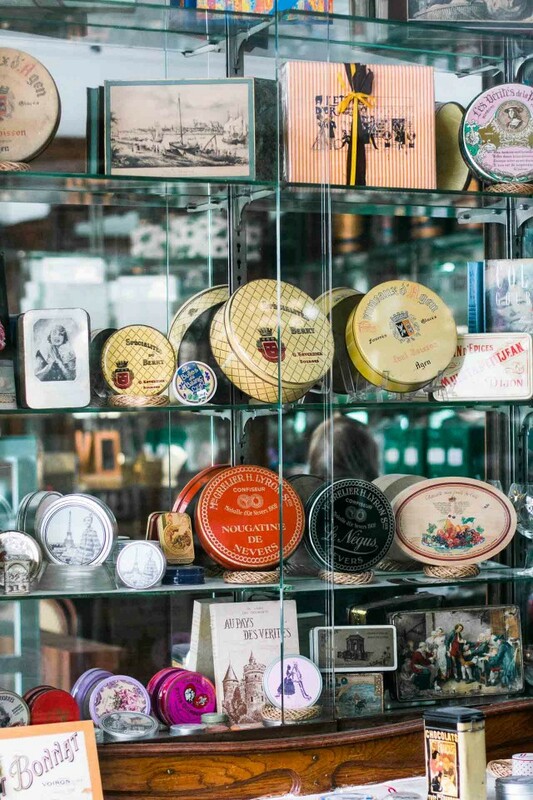 The store reopened and Madame Acabo is back, presiding over Bernachon chocolates, Bonnat bars, Mazet pralines, and the other candies and treats that filled the glass jars that were the hallmark of her only-in-Paris shop. Over lunch, she could barely contain how excited she was to have her store back. Leading up to the reopening, Denise has been working hard to fill the shelves and jars with all the treats and treasures that she’s known for. The wooden table that once held the famed Bernachon bars has been repaired, and stacked again with France’s renowned bean-to-bar chocolate bars. 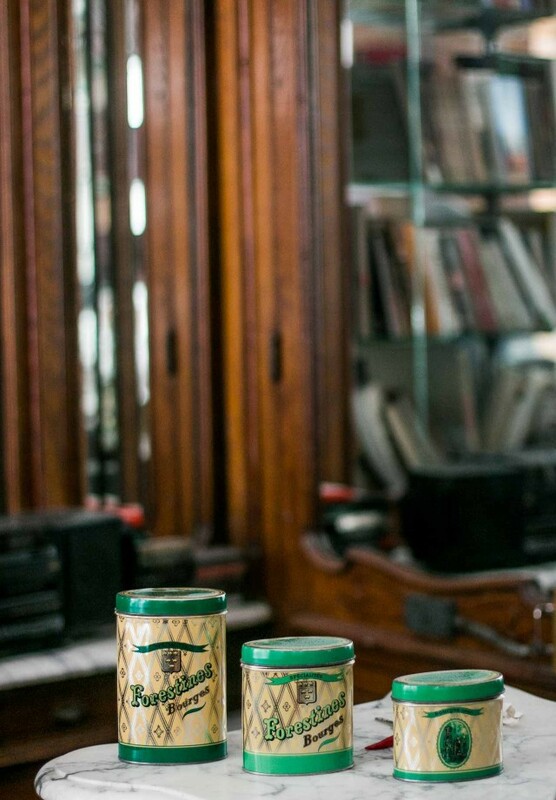 And a new luster has been given to the glass and refinished woodwork, bringing back the shine to this Paris treasure. That’s such great news ! She’s a lovely lady and her delicious products will be more than welcome for the holiday season. Yesssss! I noticed work going on there about a month ago so I’m delighted she’s back so soon. Well, actually it’s been a while, but it’s wonderful that she’s forging ahead. Can’t wait to visit next month! Such great news. I will definitely be visiting when I am in Paris in January. So, David, I know this is a tough question, but if there was ONE thing you would recommend buying (OK, two), what would it be? The Kalouga bars from Bernachon. If you are travelling, bring a hard sided box for the Kalouga Bars! They are the wonderful but soft and you don’t want them to get crushed. 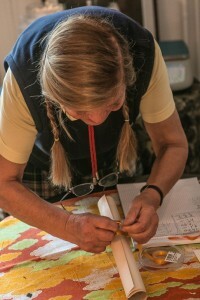 This is fantastic news – bravo to Mme Acabo, what a wonderful lady and shop! Such a great news ! I’ll make sure to go soon to support and will put it back on my Gourmet list for my guests. Thanks David for letting us know. I’m glad to hear the store will be opening again. I love a happy ending…..and good chocolate. The best possible news! Thank you Mme Acabo, it will be a pleasure to see you again, and thank you David for letting us know. This is such wonderful news! I so happy for Denise. She must be so excited! Although it is personally bittersweet as I was just in Paris last week and can’t believer that I missed the reopening by two measly weeks. I’d have made changes to my travel plans if I’d known, as I’ve been dreaming of coming to the store for years. I guess that just gives me one more reason to aim for another trip to Paris! How wonderful! What a strong woman! There is a god! This alone is reason enough for a trip to celebrate in Paris! Thanks for the great news David. So glad that she is able to get her shop open again! And just in time for a Christmas order too, double gift. This is such wonderful news! Looking forward to visiting when we are there in the spring. Great reminder to persevere in the face of set backs! I am glad you shared this post, David. If I’m lucky enough to visit Paris again in the near future, I will surely visit this gem. Thank you, David, for keeping us apprised of Mme Acabo’s progress. You are a good friend indeed! Personally, I am looking forward with delight to introducing A l’Etoile d’Or to my husband when we visit in November. Hurray! I didn’t know about this shop. Thank you for the info. We’ll definitely go there when we travel to Paris. And to think that November 3 is our anniversary, too! Under President Hollande, French investors have little to invest in within France, so I am sure that M. Acabo will prove a good investment. I cannot begin to express how happy this makes me! I lived on Rue Victor Masse, right around the corner, while studying pastry in Paris back in 2003. I adored visiting this shop and seeing Madame Acabo and basking in her enthusiasm. 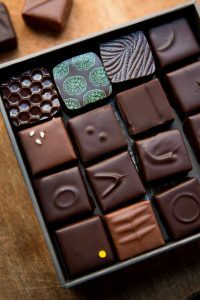 In fact, tasting the Bernachon bon bons she sold was one of the key experiences that steered me away from cakes and toward chocolate (my current profession) as my primary focus after pastry school. I took so many visitors to this special place, and I was crushed to learn of the explosion and her forced closing. As a chocolatier and retailer, I know how challenging it is to make a go of it under the best of circumstances. What a remarkable come-back she has made! So, so, so happy for Madame Acabo that she has fought her way back! She’s an inspiration. Bon courage, Madame, and Félicitations! Beautiful inspirational story, Casey. And sweet story about Mme Denise, David. I’m so happy for her. Please give her best wishes from all of her fans here. I’m so happy to hear this. I was thinking about her shop as we walked in her neighborhood last month. Now I’ll have to wait until next trip to get back there, but looking forward to it. Fantastic news. Wish I could book a flight to Paris immediately. So glad this all work worked out! She’s such a wonderful woman. This news made my day! This is the best news! I’m so happy! Please send her our best wishes. Someday I hope to be able to travel to France and visit her beautiful shop … So happy for her, truly!!! Fantastic news for Madame Acabo as well as her fans! It’s enough for me to book a trip to Paris…almost. Looking forward to seeing you, David, as well at Yotam, later this week in San Francisco. My favorite foodies together!! And chocolate news! The week bodes well. This is fabulous news!! Finally I will be able to get more Bernahcon Kalouga bars!! Wonderful news! I always am happy to hear of icons returning after difficult and/or sad events. It’s people like Mme who make Paris an iconic city. At first I thought she was a victim of the explosion. Thank you she was not. The end of that first paragraph gave me the heebee jeebs! I’m glad I was wrong, that she’s ok, and her shop is re-opening. I myself plan on being a older lady who still rocks braids someday. This is such wonderful news. I am scheduled to lecture in Paris in the late spring of 2016. I will definitely pay a visit to A l’Etoile d’Or and Mme Acabo! I’m so happy to hear this, thank you for updating us! I look forward to visiting her shop. David, thank you for the wonderful news! We ran into Denise last year at the Salon du Chocolat. She pulled out a binder of pictures of the shop, the damage and of you. We will definitely be shopping there this spring! There is so much bad news around us; this is balm for the soul. Even if I never get back there, it will be good to know that in this tiny corner of Paris things have returned to their cheerful state of normal. What amazing and unexpected news. I had visited Ms. Acabo’s jewel box shortly before the accident and was completely enchanted with her and her shop. I have her lovely wrapping paper framed in my kitchen and I hope to say that if I ever get back to Paris, she will be the first place that I go to (with a big empty suitcase). Thank you for the update and for keeping us connected to her. Dear David, I am so happy for her. Hopefully I can visit it someday. Yay! I will be in Paris for six weeks from December 7, so I can now add this store to my list of must-visits! David…..just wondering if French insurance companies are as difficult to deal with, as here in America. So happy to hear that Madame is returning…bravo! When the plywood came down on the storefront I was pleasantly surprised to see that the bulk of the art nouveau casework survived (or was restored). Having walked past more recently than that (including just yesterday), it does not appear that the quirky sidewalk display drawer will be part of the restoration. We — my wife in particular — loved that bit. Great to see she’s making a comeback. I am overjoyed to hear this news. Felicitations, Mme Acabo! We will visit next year. I don’t often comment but I have to mention that I’m so happy for her. Happy she has the courage to reopen her shop and just be unique, authentic, and wonderful. She’s an inspiration and I hope she will know of all the wonderful comments on your blog. I didn’t even know of this store, but I’m so happy to read she’s coming back. Will look for it the next time I’m in Paris–I hope there’s a next time! I read all your articles and take notes for my next trip to Paris. I know Paris well, I was born in that city, most of the place you cite are my turf. The forestines come from the city of Bourges. These candies are superb, unfortunately the store had a fire and the store is closed for a while. They are trying they are trying to reopen the place. I love your recipes, some are very fatty in my book, and pretty soon we will not eat as much meat or charcuterie. Adieu rillettes et saucisses de Lyon, or Pate de campagne – tant pis! 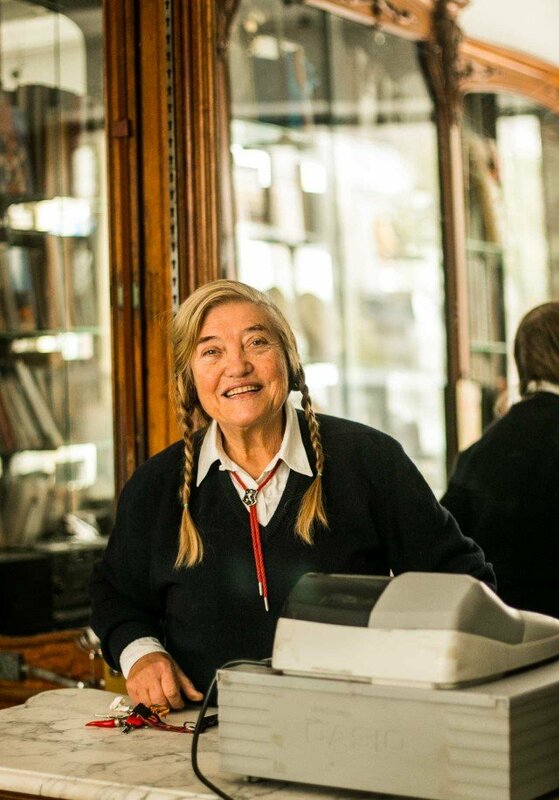 Please give Madame Acabo my Congratulations for the courage to forge ahead and reopen her wonderful shop. Bravo Mme Acabo! I’m so glad for her and of course for all of us- she is a true treasure and lovely lady. Last time I visited, we talked for an hour and it was delightful! I actually traveled to Lyon specifically for a visit to Bernachon last year after the terrible destruction, and the ladies in the Bernachon store also had nothing but lovely things to say about Mme Acabo. Sending continued healing and a joyous opening celebration to her for November! Hi David – Thank you for the update on Mme Denise Acabo. It was because of your blog that I visited her shop when I went to visit friends in Paris. I found her to be so warm, friendly and motherly. It was one of the highlights of my trip that year. My heart sank when I learned of the explosion that decimated her shop but I am so happy now that she is back on her feet again. I will certainly make it a point to visit her when I go back and enjoy those Bernachon chocolate bars once more. I’m so happy for her! I’ve lived in Paris for two years and used to go to her store every month to grab Kalouga and Orange Bernachon chocolate bars. And of course, I used to talk with Denise for long hours. She’s passionate about her store and her clients! This just fills my heart with happiness! I´m so happy about this. Thanks for letting us know. Is the store definitely opening on Nov. 3? I would come to Paris for two days, because of it. I really missed visiting her store the past few times I was in Paris. She told me that she is opening on November 3rd, however things somedays don’t always go as planned : ) So always best to call ahead if you can, just in case it’s not. Thanks. I’m already hooked. I’ll try to get two days of from work and just hope to find an opened chocolate heaven. Went there on Nov. 4. Lovely as before. Thanks again for letting us know about the reopening. Hooray! This photo of Madame Acabo is one of my very favorite photos ever. I don’t know her, but with her twinkling eyes, bright smile, and youthful braid– she seems to be bursting with girlish happiness. Love it. That’s wonderful news! I remember when you wrote about the fire and feeling so sad that I’d never been or get to go. All of the above plus a big THANK YOU to you David. I am sure that your support and confidence has helped inspire Madame Acabo to re-open. I know she was unsure about it.